In early February, management at Leeds Deliveroo managed to infiltrate a WhatsApp group being used by our members to organise other riders. Upon finding the names of key organisers Deliveroo acted immediately. 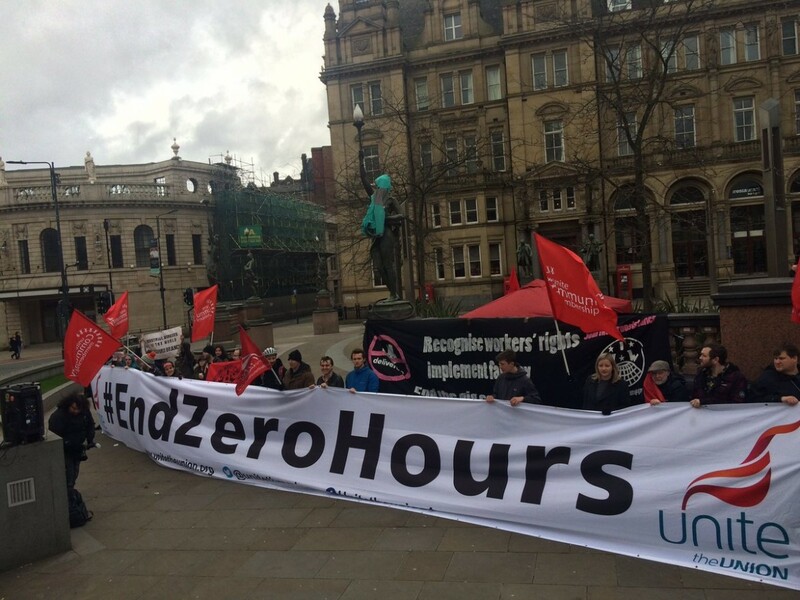 Five riders had their full time fixed hours removed and are now only given minimal shifts with one days notice and limited to a few hours a week. Two other riders have been sacked completely. Their hardship is immediate. Two riders have kids, all have rent and bills to pay, and as ‘self employed’ all have a tax bill coming in three months that most were expecting to pay from money earned in the last quarter. 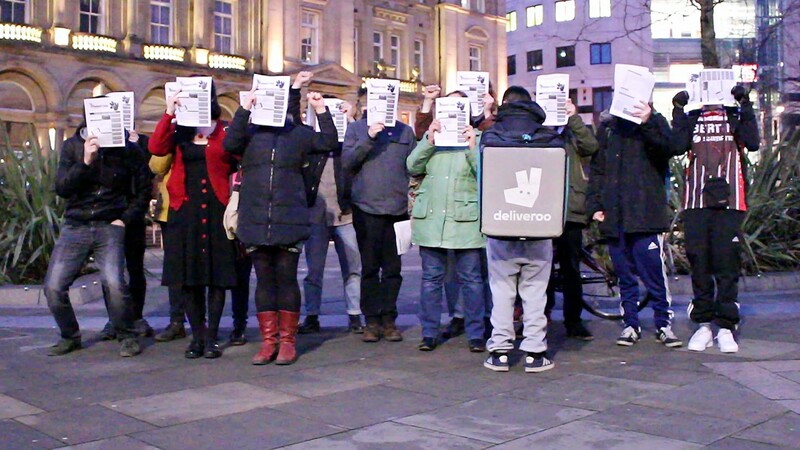 Deliveroo’s actions are a direct attack on the right to join a union. Our union, the IWW, is standing by us. 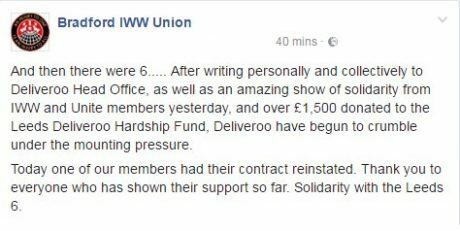 But the IWW is a small union with limited funds and we need your support, now more than ever. Money raised from this crowdfund will go directly to a hardship fund for the six workers that have fallen victim to Deliveroo’s anti-union attack. The IWW is bringing onboard one of the sacked riders to lead on the dispute with Deliveroo and is contributing much needed cash to the hardship fund. This is the gig economy in action. Please donate anything you can afford to our hardship fund. Follow us on Twitter and Facebook to keep up to date with the campaign. As a Deliveroo customer, I am writing to express my disappointment at the treatment of your riders in Leeds. 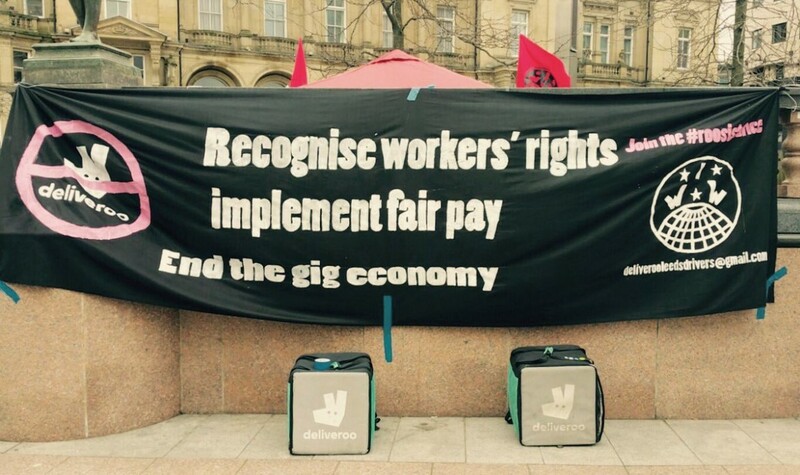 Your continued failure to reinstate those riders targeted for their union activity, is extremely concerning – if you wish to keep my business then their reinstatement should be of the utmost priority. I welcome that you have acknowledged malpractice by the Leeds management, however this is little more than spin unless the riders and their union are involved in improving the way that riders in Leeds are managed. Again, you will not be enjoying my continued custom unless you hold formal talks with riders and any union they choose to represent them. I am further concerned about your continued over-recruitment in Leeds. This threatens existing riders’ ability to work enough hours and their ability to earn a living wage whilst doing so. I look forward to you extending your recruitment freeze in Brighton to all other cities that need it. Across the country, you avoid making national insurance contributions and paying riders sick and holiday pay by wrongly classing them as self-employed. As a tax payer I am disgusted that you look to avoid your duties as an employer and instead attempt to pass these on to your riders and the state. Once more, if you wish to keep my business, you will rectify this as soon as possible.